10. Delphinium L., Sp. Pl. 530. 1753. Gen. Pl. ed. 5:602.1754, Boiss., Fl. Or. 1:72. 1867, Hook.f. & Thoms. in Hook.f., Fl. Brit. Ind. 1:24.1872, E. Huth in Engler, Bot. Jahrb. 20:322-499. 1895, P. Munz in J. Arn. Arb. 48: 249-302, 476-545, 1967, 49: 73-166, 232-259. 1968, Qureshi & Chaudhri in Pak. Syst. 4(1-2):54.1988. Usually perennial herbs, rarely biennials or annuals, with tuberiform roots or a woody, deep seated root crown or a rhizome-l ike base. Leaves basal or cauline, palmatifid or lobed, segments dissected in various ways or dentate. Flowers zygomorphic, usually in terminal racemes or panicles. Pedicles in the axils of ± foliose bracts, bearing usually 2 bracteoles. Sepals petaloid, the posterior (upper) one spurred. 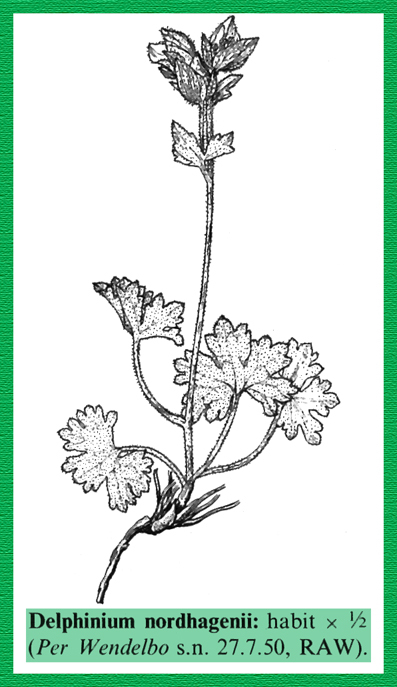 Petals 4, the upper pair produced into nectariferous spurs extending into the sepal spur, upper part of lamina ± distinct, the lower pair with a slender claw and an expanded lamina. Stamens numerous, usually included. Carpels 3-5, free, becoming follicles. Seeds obpyramidal, winged or wingless at angles, surface with overlapping scales or ridges. About 270 species in the north temperate region. The present account closely follows the excellent treatment of Munz (1967, 1968). No really critical groups seem to occur in Pakistan, though sometimes good species have been overlooked and thereby obscured the limits of others before Munz’s account had been published. Represented in Pakistan by 16 species. Several species are cultivated for ornamental purposes, but have no other economical value. Stout plant, at least 50 cm or more tall, glabrous, with much branched stems. Basal leaves already dried up at flowering time, only the petioles remaining. Only one broken stem leaf is preserved: probably orbicular to slightly reniform in outline, primary segments 3, the two lateral ones divided again very deeply, all three free to the base, central segment linear-lanceolate, about 10 cm long, 8-10 mm wide, acute, with a few long lateral teeth which are upto 20 mm long, 4-5 mm wide at base, directed obliquely forwards. Inflorescence paniculate, loose, each of its branches with about 5 flowers in the distal part. Pedicels 12-20 mm long, hairy above the bracteoles. Bracts narrowly linear, about 4 mm long, bracteoles about 1-2 mm, filiform, situated at about middle of the pedicel. Flowers yellow. Lateral sepals elliptic, about 11-12 mm long, 5 mm wide, elliptic-lanceolate, sepals upto 15 mm long, upper sepal 9-10 mm long, 5-6 mm wide, subacute, spur narrow, 14-16 mm long, 2.5 nun wide at base, straight or with upturned tip, often somewhat pointed. Upper petal glabrous, 7-8 mm long, obliquely tru ncate, lateral ones 12 mm long, bifurcate, bearded with long, white hairs. Carpels 3, with short, appressed, ferruginous hairs, style 2.5 mm long. Mature fruits not seen. A-7 Gilgit: Kargah, behind Gilgit, dry slopes and hills, alt. 2600-2900 m, 15 July 1954, F. Schmid 1978 (RAW). The only yellow flowering Delphinium known from Pakistan and adjacent areas, that cannot be matched with any other species until now. The specimen is too fragmentary, however, to draw the final conclusions. Fl. Per. : July. Delphinium bicarpellatum Qureshi & Chaudhri. Pak. Syst. 2:7.1978. Type: NWFP: Chitral: Saksair, c. 3600 m, Muqarrab Shah & Dilawar Khan 2705 (ISL). The taxon, from the specimen figured appears to be Delphinium cashmerianum. According to the authors (op.cit. ), Delphinium bicarpellatum differs from both Delphinium cashmerianum and Delphinium vestitum in the oblong leaf segments and 2 carpels. Similar leaf segments have been observed in Delphinium vestitum gatherings, such as M. Nath 4341 from the Kulu valley and M. Nath s.n. 12.9.1935 from Jammu Thatch (Kulu). Both specimens have 3 carpels, On the other hand plants with wedge-shaped leaf segments such as found in Delphinium cashmerianum (or Delphinium vestitum) may sometimes exhibit 2 carpels as noted in Delphinium cashmerianum (Kagan, M. Sulyman 2, RAW). Delphinium nuristanicum Tamura in Acta Phytotax. Geohot. 16:141.1956. Qureshi & Chaudhri (Pak. Syst. 4(1,2):80.1988) identified a specimen from Chitral (Toppin 804, K) under Delphinium nuristanicum Tamura. I have not been able to verify this.